Queenslanders will join the rest of Australia in celebrating the 110th anniversary of the Australian flag on Saturday. According to Australian Governor-General Quentin Bryce the flag has a special place for all. “It is much loved, touched, worn and flown by Australians here and across the world. It graces our most solemn occasions and significant moments, our arrivals and departures,” she said in a statement. Chief of the Defence Force General David Hurley told Newsbytes the flag was important for those who fought under it. “It is our constant reminder of our sworn duty to protect Australia and the Australian people and of the legacy left by those who served before us,” he said. General Hurley said all Australians should take time to think what the flag meant to them on this anniversary. The Australian flag has the Southern Cross representing our geographical position in the Southern Hemisphere and a Commonwealth star symbolising the federation of States and Territories. The Union Jack is a reminder of our heritage and democratic roots, the Westminster system. The first official raising of the blue Australian flag was on 3 September 1901 at the Royal Exhibition Building in Melbourne. 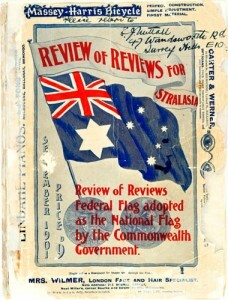 Picture: “Review of Reviews” front cover signed by Melbourne architect Egbert Nuttal, one of the four joint winners of the flag design competition in 1901.